renk (color), which emphasizes the variety of Turkish music from popular to classical and secular to sacred, and sohbet (conversation), which emphasizes the value of presenting that music in conversation with other traditions. The group is particularly interested in exploring and rethinking relations with surrounding cultures with whom Turkey has traditionally been engaged in conflict, such as Greek and Armenian traditions. 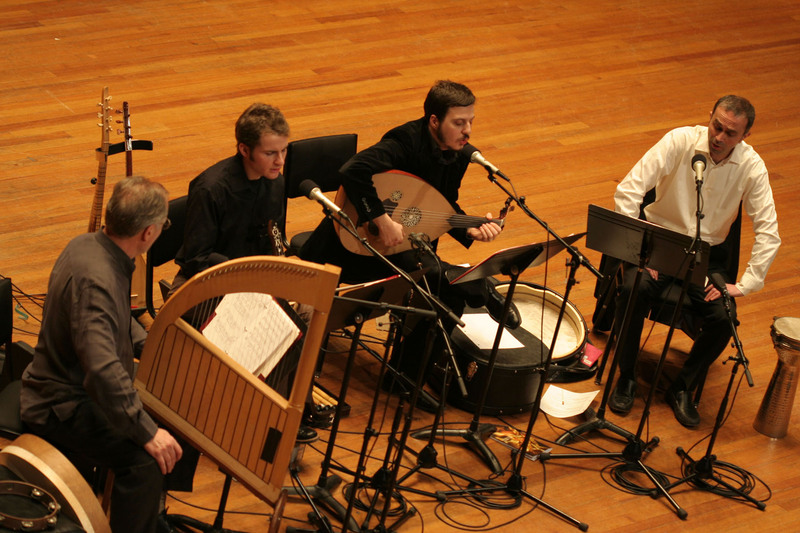 Dünya features Robert Labaree, who earned his MA from Wesleyan in 1980 and his PhD in 1990, ceng (Middle Eastern harp) and voice; Mehmet Ali Sanlikol, voice, ney (end-blown flute), ud and saz (Middle Eastern short and long necked lutes); Cem Mutlu, percussion, voice; and Panayotis League, kemence (spike fiddle), voice. Co-sponsored by the Middle Eastern Studies Certificate Program. Posted by Alex in Events on March 26, 2010 at 1:26 PM.